Honda has published fuel and CO2 figures for its new CR-V Hybrid, which offers similar CO2 emissions to the 1.6-litre diesel it replaces, despite the move to WLTP-derived fuel economy figures. Debuting at the Paris Motor Show in production-ready form, it launches alongside the petrol CR-V and will be the first time Honda has offered its mid-size SUV with a hybrid drivetrain. There will be two and four-wheel drive hybrids, the former offering CO2 emissions of 120g/km under the WLTP-derived ‘NEDC Correlated’ combined cycle. That compares to 115g/km emitted by the old 1.6-litre i-DTEC diesel, under the often more forgiving ‘true’ NEDC figures, and puts the hybrid in the 25% Benefit-in-Kind bracket this year, compared to 28% for the outgoing diesel, due to the 4% surcharge introduced in April. Exact BiK costs won’t be known until pricing is revealed, compared to the £25,130 entry-level diesel CR-V.
Official combined average fuel economy for the Hybrid stands at 53.3mpg compared to 64.2mpg for the diesel. 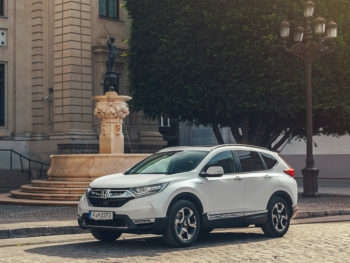 The CR-V Hybrid will also be offered in an all-wheel drive variant – previously only the petrol engine offered this – with WLTP-tested CO2 emissions of 126g/km and official average combined fuel economy of 51.4 mpg. Although Marc Samuel, Honda UK’s fleet sales operations manager, told Fleet World earlier this year that it was a “bold” move to take out diesel from the range, the lower BiK rating for the Hybrid will help show fleets the benefits of the move. The carmaker also announced last week that the CR-V Hybrid can run on battery power alone for more than 50% of a moderate-speed journey, while at faster speeds, the car will be in EV Drive for approximately one third of the time.